Yo Gabba Gabba! steers kids and adults toward bands that are worth a damn. 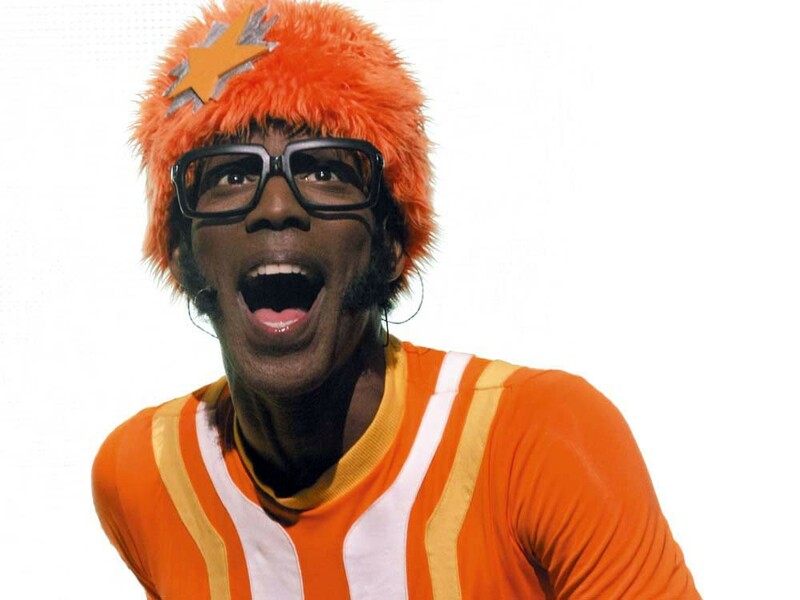 DJ Lance Rock, host of Yo Gabba Gabba! Today, hundreds of thousands of babies and toddlers around the world like bugs because Weezer does. Those same kids know all about beatboxing because of rapper Biz Markie, and about good hygiene thanks to dance-band Chromeo. They’ve watched Questlove play drums, danced like a mime with Sarah Silverman and rocked out to Devo. It’s all because Scott Schultz and Christian Jacobs, two guys who’d just become dads, thought children’s programming was kind of dumb. As longtime musicians (Jacobs is lead singer in superhero ska band the Aquabats), they found the music their kids were being exposed to through children’s television was just ... lame. As music freaks, they realized their kids were just as responsive to the music on kid’s shows as they were to, say, the Ramones. Their idea was to create a music show. Not just any music show, but one that would be equal parts indie rock, Sesame Street, Star Trek and Flaming Lips concert. That idea would soon become the children’s show Yo Gabba Gabba! — a program that has since become one of the most popular television shows on the air today, taking home two Daytime Emmy Awards and a BAFTA Children’s Award while broadcasting around the world. YGG! is, in some respects, like many other kids shows. There are lessons to be learned, words to be spelled and stories to be heard. Fluffy oversized characters tromp around a martian landscape with googly grins and wide eyes permanently plastered on their faces. A super enthusiastic host cheers kids to keep watching the next segment. But where YGG! differs is in the details. This host is DJ Lance Rock, a man who lives in Gabbaland and wears an awesome orange sweat suit and furry gumdrop hat. The fluffy characters resemble animals, but seem more like Crayola-colored imaginary friends than petting-zoo residents. The lessons taught on the show are about beatboxing, break dancing and making funny faces. And bands — not kid-friendly acts like the Jonas Brothers or Miley Cyrus — sing to them in ways that kids can understand. Schultz says that the TV program and YGG! live show are directly inspired by some of his favorite bands. The Shins, Shiny Toy Guns, Mark Mothersbaugh (and Devo), Rahzel, the Roots, Datarock, MGMT, Mates of State, Of Montreal, Jimmy Eat World and Hot Hot Heat. That’s not even the full list. And the show has recruited unbelievable talent to record songs set to animations: Mark Kozelek (Sun Kil Moon, Red House Painters), Low, Dean & Britta (Galaxie 500), Enon, Autolux and Mason Jennings, among others. Schultz admits a kids show appearance usually means the kiss of death to a band. But YGG! seems only to help them. And it has been a recruitment tool to get more than just kids to love the show. The response from college students and adults without children landed YGG! a spot at Coachella this year — something Schultz said they were reluctant to do. But he says it made them realize that even adults like to act like kids. We all want to enjoy the simplest things: bubbles, bright colors and confetti.